Flow styled round diamond pendant, with unique naturalistic design, holding a bezel set 0.25cts round brilliant cut diamond. Set with a 0.25ct Diamond of your choosing, this design curves gracefully around the Diamond to create a stylish pendant. The Round Brilliant cut Diamond is bezel set within the slider pendant design, perfect for the 18 inch Venetian Box chain which is included in the purchase. We can craft your pendant and chain in a number of precious metal choices, including 18ct White Gold, 18ct Yellow Gold and Platinum. We are also proud to offer this design in our fully ethical 18ct Fairtrade Gold options too. Please allow us approximately 3-4 weeks to craft your necklace in your desired precious metal. It will then be delivered straight to your door by a secure courier, presented in our own Serendipity Diamonds packaging. 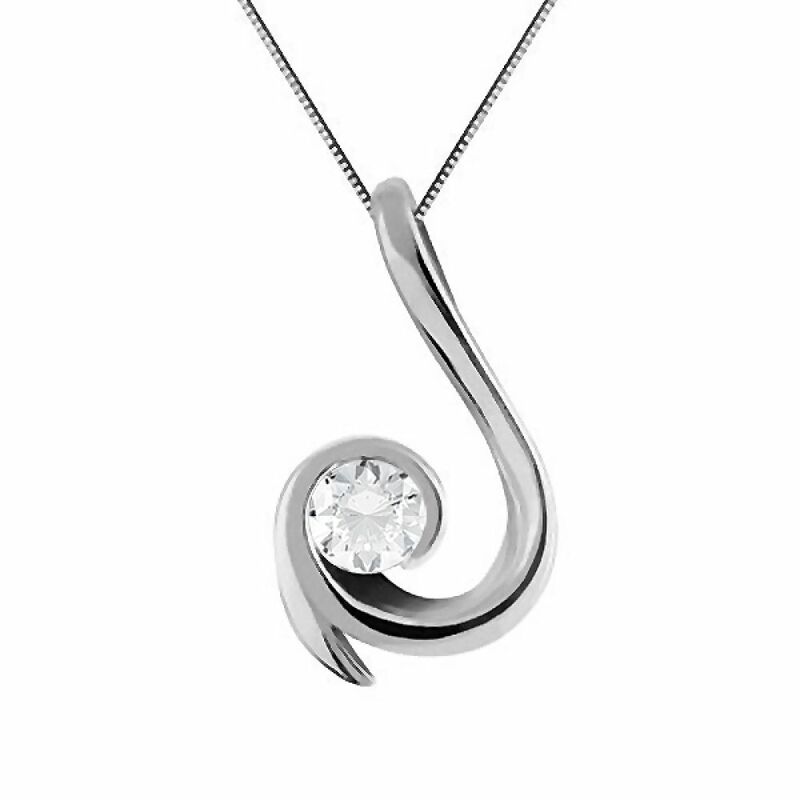 Please contact us for any help and guidance on our Diamond pendant range. Upon completion, your diamond pendant will be exquisitely packaged in a gloss white presentation box, with accompanying documentation, delivered within our large outer box, within an outer plain wrap for discretion. We post using International Signed For Delivery by Royal Mail. We deliver daily across the Republic of Ireland covering most areas, with deliveries taking around 2 days to arrive. Once your parcel leaves our care, we email you tracking details and your parcel remains fully insured until is signed for upon arrival. At Serendipity Diamonds we offer exceptional value for money with an amazing combination of exceptional service, incredible quality and an outstanding price, all beautifully presented with the very best experience we can create from your first experience with us to the arrival of your diamond pendant. All diamonds possess the same high standard that our jewellery carries. We provide a minimum of a very good cut grade and only work with 100% natural diamonds, provided with conflict-free assurances. All diamond solitaire pendants weighing 0.30 carats and above, selected in grades above J colour and SI2 clarity will include full certification for your reassurance. Minimum 'Very Good' diamond cut. We supply all pendants attached with a chain measuring 18 inches as standard.